While the Ebola epidemic rages on throughout Western Africa, far beyond the borders of Guinea, the country in which it first began, a recent analysis of the disease’s emergence has revealed the geographic origin of the epidemic and the pathogen’s likely source. Research suggests that the Guinean strain of the Zaire Ebolavirus originated from a single group of patients living in the heavily forested town of Guéckédougou in the remote prefecture of Gueckedou. The town is a small governmental subdivision which borders both Liberia and Sierra Leone, two countries which also host significant portions of the forest that surrounds Guekedou. The Guinean strain of the deadly virus is a member of the Ebolavirus genus, a group of pathogens which cause deadly hemorrhagic fevers in the infected. Research has shown that it is not only part of that genus but it is also an extremely close relative of the Zaire Ebolavirus, which was not only the first species of Ebolavirus identified by humans, but was – and still is – the deadliest strain of the virus, killing around 90 percent of those it infects. 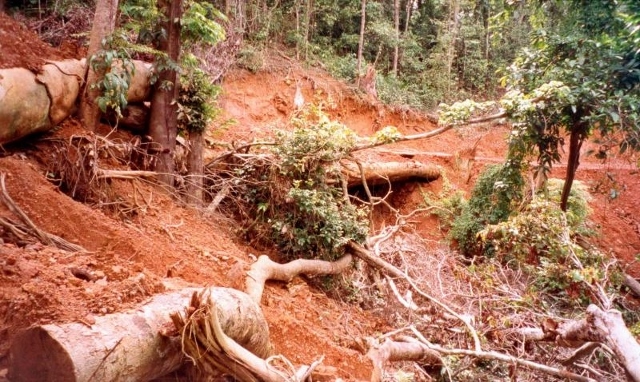 The landscape surrounding Guekedou, more commonly known as the Western Guinean Lowland Forests, is threatened on all sides by illegal logging, improper land use, and ill-advised exploitation by all three of the countries which exist in the shade of its many trees. It is ironic that this threatened landscape, which for years has been suffering a slow death at the hands of West Africans (either directly or through the government’s inability to enforce forestry laws), has been identified as the source of the pathogen that threatens all of Western Africa by infecting and killing more people every single day. This determination is unlikely to ease the suffering of any West Africans afflicted by Ebola or assist health workers as they attempt to control the spread of the virus. The virus quickly swept through Guinea and on through to Liberia and Sierra Leone in a matter of weeks after the reports of the first cases in Gueckedou reached the ears of health officials. Since then, over 500 people have been slain by the microbe, dwarfing the number of people killed during every other outbreak since the disease was identified in the 1970s. Many people and organizations have wondered what has allowed these numbers to become so high. The World Health Organization, along with other public-health oriented non-governmental organizations (NGOs) such as Doctors Without Borders or Médecins Sans Frontières (MSF), have cited ignorance of the disease as one of many significant factors contributing to the epidemic. The public health organizations supported this claim by referring to incidents where the infected either fled hospitals, or instances in which hospital workers themselves lacked the necessary training to contain the extremely contagious virus. The main point to be taken is that both the health care system and the people of the region itself were totally unprepared for an Ebola outbreak, leaving many unanswered questions as to how this could have happened. There is one answer to the question that seems fairly obvious: the people and institutions of Western Africa had never actually experienced an outbreak of the disease within their region. Prior to this year, Ebola outbreaks occurred primarily in Central Africa and had been doing so for over 30 years. Thus the threat of Ebola was not at the forefront of health ministers’ minds while directing the development of their nations’ health infrastructure. Even MSF was more concerned with fighting HIV/AIDS, cholera outbreaks and malaria than Ebola, which did not become a top priority for the organization until March of 2014. Before that date they were just as blissfully ignorant as the rest of the region about the coming sylvan plague. However, practically speaking, they really could not have seen it coming. The idea of a Guinean strain of Zaire Ebolavirus epidemic born of one of Western Africa’s most threatened woodlands would seem absolutely ridiculous to them. Just about any other medical professional in that region would likely have responded the same way, citing the simple fact that during the more than 30 years between the identification of Ebola, its many outbreaks throughout the rest of the African continent and the current epidemic, the Western Guinean Lowland Forests was just as real as it is today, and yet not a single strain of the Ebola virus infected any Western Africans. Logically then, if the forests (or rather the animals which live inside of the forests) existed alongside the communities which are now being stripped of their friends and families by one of the forest’s microbial inhabitants for over 30 years without any reported Ebola outbreaks, then something must have changed in the relationship between the people and the land upon which they live and rely. Melissa Leach, who has studied how the citizens as well as the governments of Africa’s many countries use (and misuse) their land, presents a theory as to why the disease has begun appearing in Western Africa after 38 years of complete absence. Basically, all three countries that are currently struggling to contain the pathogen, even the town where the virus first began its killing spree, had begun to significantly alter the landscape. These alterations transformed the local environment in ways that dramatically increased their likelihood of being exposed to the virus. Similar decisions were made in other parts of the now disease infested region prior to the appearance and dissemination of the disease. In Guéckédougou, the ecological amendments had occurred slowly as the communities nearer to the forests began to expand, while its neighbor’s woodland woes occurred quickly and on a scale never seen before, and cost them dearly even before the virus crossed into their borders. The decision to allow the exploitation and reclamation of the massive forest which all three nations share appeared to be a prudent one, given recent developments within their respective borders. So it was that the regions’ governments, its environmental criminals whose collars were just as often white as they were blue, and even simple farmers all set out to modify the threatened landscape all for their own profit, blissfully unaware of the deadly cost their rapacious actions would incur upon the future. The epidemic, which has skipped between communities and states, causing nothing but death and suffering, began in the in the village of Gueckedou, which despite its proximity to an important forest landscape, does not exist in the shade of a forest canopy. The locals have made small consistent changes to the local ecosystem over the years, changes that have dramatically altered the whole area. The once forested sections of the town now resemble a patchwork of farmland mixed together with forest “islands,” unaltered sections of the forest which once dominated the area but had been recently converted into farm land. Over the years more and more forest islands could be seen as the farmers encroached upon the forest reserve in search of better soils. The intentional and sporadic human repurposing of forest ecosystems is not limited to simple farming activities. Reports indicated that as the forest became more accessible, its citizens began conducting more mining and hunting activities in the forested areas. This is where the virus enters the drama. Zaire Ebolavirus is “zoonotic,” meaning that it is carried by animals who act as its source or “reservoirs,” the most likely being bats. However before the locals began to encroach upon the forest in such a destructive manner they had always lived near bats and other creatures found underneath the canopies of the vast woodland landscape. It was only as the townspeople began moving onto and into land which had traditionally belonged to the forest and its inhabitants that they began to encounter many such “reservoirs,” with much greater frequency than ever before. With each encounter came the probability of an infection and unlike before, such run-ins were more common than ever, meaning that the virus (which had always been inside the forest) finally had enough opportunities to infect nearby humans, that it eventually succeeded. In other words, what happened in Gueckedou has been happening in the rest of the region for years. If the deforestation hypothesis is indeed correct and given the immense amount of improper land alterations which contribute to the loss of forest area, then West Africans, whose misadventures in forestry were bringing them ever closer to the origin and cause of the deadly Ebola virus, were lucky that an epidemic did not occur sooner. Every single country which is now fighting to protects its citizens from a disease once thought to be trapped in the jungles of the Congo has recently failed to properly manage their forest areas, even those sections which constitute portions of the Western Guinean Lowland Forests have not been spared the institutional incompetence and greed of Guinea, Liberia, or Sierra Leone. Unfortunately though, unlike environmental degradation in other parts of the world, which harms mostly future generations, the three nations have damaged their shared environment in such a way that it is the current generation that must suffer and even die in an epidemic created by the mistakes and oversights of their parents and their elders. For instance, Liberia essentially sold the logging rights (in the form of a poorly designed and regulated Private Use Permit system) of up to over half of its forested areas – 40 percent of which are part of the Guinean Rainforest. Those permits were not intended for logging ventures but for small landholders. However large companies were able to overcome this hurdle by using bribes and other tactics to get those small landholders and even entire villages to sign their forests off for logging. Once the paper was signed, large enterprises came right in and started tearing the trees right out from the soil. Individuals in search of work also partook in the dubious logging ventures, though they did not profit nearly as much. Other than enriching business entities which were flaunting the laws, the only other effect of the disastrous permitting policies was absolutely massive deforestation throughout the country. All three of the infected countries had been dealing with severe deforestation prior to the outbreaks, which occurred all over the region in a nonlinear manner. While making a direct, causative argument would be impossible, it is reasonable to assume that the three country’s lax behavior regarding land use and shortsighted decisions relating to the exploitation of their own resources likely aided the spread of the virus by exposing their citizens to the forests and their many inhabitants. On any other continent, outdoor labor is very unlikely to result in workers contracting highly infectious and very deadly pathogens. However, among those creatures which live in the dark forests of Western Africa, there are many which serve as Ebola reservoirs. These animals had simply lived peacefully in their forest homes, unaware of the deadly pathogens which existed inside them as the humans came closer and closer to their natural habitat. Those microbes were likewise existing harmlessly inside of their reservoirs, but were also ready to jump ship for a host who could provide the proper microbial environment for its reproduction. After what could have been anywhere from a single encounter to hundreds of near misses, the Guinean strain of Ebola was finally able to enter and subsequently infect a human being, whose internal biochemistry it then used to spread itself far and wide across the region until it became a veritable epidemic that has killed almost 900 people since March. All this because a farming community refused modify its planting methods, opting instead to search for more fertile soil in the wild forests, and also because two governments lacked the institutional strength and regulatory power to stop the reckless plunder of their lands. The origin of this deadly epidemic is therefore not just a scientific pursuit, but also lesson in the dreadful events which can occur when governments fail to control their citizens, whether they be farmers or criminal businessmen. The situation in West Africa is proof positive that institutional failure not only hurts, it can kill. If these countries do not learn to protect their resources, to value them instead of selling them off en masse, and of course to properly manage them, then West Africa seems likely to end up like the origin of Ebola itself: Central Africa, which has deadly Ebola outbreaks and epidemics far more often than any other part of the continent. West African nations must now look to their forests as protective barriers, or even perhaps cages – the only places inside of which the origins and the cause of Ebola outbreaks can be contained until the development of a viable treatment. 15 Responses to "Ebola: The Origin of West Africa’s Deadly Epidemic"